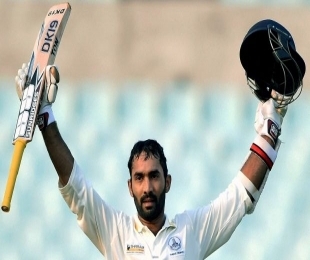 Dinesh Karthik had a fight on his hands in the run-up to the domestic season. The backbone of Tamil Nadu’s middle-order had to recuperate from a wrist injury. He also worked with former India player Pravin Amre in Mumbai in a bid to change his grip a bit. It took some time for him to get used to the new technique as the early part of the season (limited-overs matches) turned out to be quiet before he hit his stride in the Ranji Trophy. Karthik, who has scored 514 runs with an average of 57.11 including two hundreds and a fifty in Tamil Nadu’s seven outings, feels a lot has improved in his batting. “With Amre, we changed my downswing a little bit apart from working on my grip. I had my wrist injury because of the grip,” he said. The 28-year-old spoke to this newspaper on his added responsibility in the middle order and how coach W.V. Raman has “mellowed down” in his second stint with Tamil Nadu. Has S. Badrinath’s departure to Vidarbha added more responsibility on your shoulder? I must admit that I have to be more responsible coming in the middle order. Badri’s presence had provided comfort for us. He is someone who averages around 60 and one of the greats in domestic cricket. When he left, I thought it was time I stood out for the team. Now, it’s my duty to play like a senior and show the youngsters what can be done on the field. When the season started, I did make a genuine effort at stabilising the TN batting line-up. You have worked with big names such as Greg Chappell, John Wright, Gary Kirsten and Duncan Fletcher. How is W.V. Raman as coach of the Tamil Nadu team? From the person that he was in his first stint as coach of the Tamil Nadu to what he is today, he has mellowed down a lot. I’m sure he has done a lot of homework on his coaching. He had been part of other Ranji teams and had a stint in the IPL. I am sure he must have seen how others work. There is a huge change in him from what he was. You are one of the few senior players in the TN squad now. Does Raman consult you on important matters? No. He has been very clear he and the captain will take all tactical decisions. And, I think it makes a lot of sense as it’s important that people who are in-charge of the team should take the decisions. I don’t think anybody interferes or has an issue with that. I am very happy to follow what’s being told. I am someone who is very close to all the young guys in the team. I am with them. A lot of questions have been asked about the youngsters in the team and I am extremely happy for them that they all have come good. It’s a privilege to be playing with these guys and I am enjoying it. Selectors gave long ropes to some of the youngsters and in turn they have made use of the opportunities in the last few matches. Do you think TN’s future is in good hands? Definitely, yes. I think bowling is the only area of concern. I would love to see someone take up the role of L. Balaji. Bowlers like him are hard to find. In batting, we have a lot of talented youngsters. Baba brothers — Indrajith and Aparajith — have already proved their mettle. Opener Kaushik Gandhi hasn’t got long run yet. I think he is a wonderful talent and an amazing team man. Vijay Shankar is someone who has done extremely well with a few opportunities he has got. Young batsmen have it in them to take TN to the next level. But, grooming bowlers is a big challenge for us. Playing 11 league matches in the Chennai heat and turning up again to play Ranji matches is tough, physically. It’s a question of how they are going to handle it. I feel there should be a collective effort from the TNCA and the corporate (league teams) to develop bowlers. After a disappointing start to the season, TN are now on the threshold of entering the knockout stage. How do you see TN chances of ending the long wait to win the Ranji Trophy? Every year when we start a new season, we always say that we want to win the trophy. This year was quite different. It’s been a roller coaster ride. We played some very good cricket and some ordinary stuff. Once we qualify, the key is our approach in the knockout stage. We should not put pressure on us by looking at the final while playing the quarterfinal. It’s going to be a five-day contest and different from the league stage. Most of the team members haven’t played five-day matches yet. The mindset has to be different because we will be playing on neutral venues. If we get our mind together, we can give any team a run for their money. Copyright © 2019 AM2PM.Com Pvt Ltd, All Rights Reserved.